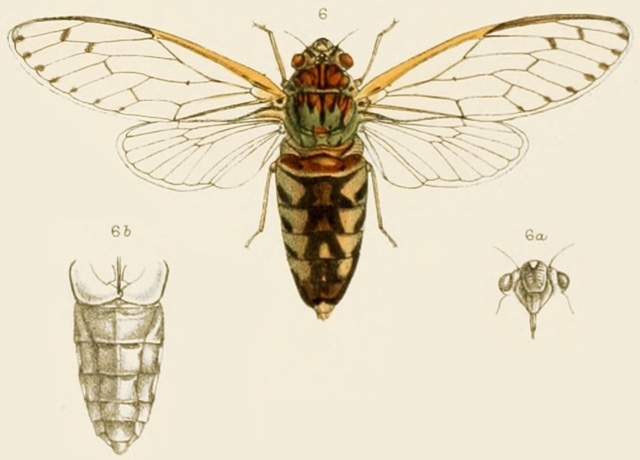 Terpnosia stipata (Walker, 1950) is a cicada found in Sri Lanka. [Male] Body above greenish-ochraceous; head with the margins of front and apical angles of vertex fuscous; the area of the ocelli, an oblique fascia on each side, and a small spot at inner margins of eyes, black. Pronotum with two central fasciae united posteriorly, the fissures, a spot on lateral margins, extreme edge of posterior margin and a spot on each side of same, black. (The discal coloration of the pronotum in the specimen described is l)ro\vnish-ochraceous.) Mesonotum with a central linear fascia with a shorter one on each side, followed by a small obconical spot and a sinuated sublateral fascia, black; two small spots in front of the cruciform elevation and the angles of same black. Abdomen with the posterior segmental margins, a broad central dorsal fascia, and a macular lateral fascia, very dark fuscous; extreme apex greyish -white. Bodj’ beneath and legs pale greenish; the abdomen beneath talc-like and semi-transparent; a few sternal spots, the anterior femoral spines, and the tarsi, more or less fuscous. Tegmina and wings pale hyaline, the venation fuscous or ochraceous; tegmina with the costal membrane ochraceous; the transverse veins at the bases of the second, third and fifth apical areas infuscated, and a marginal series of small fuscous spots situate on the longitudinal veins to apical areas. Face globose, centrally sulcated except at base, where there is a slight callosity; lateral striations profound; rostrum slightly passing the posterior coxae. Long. excl. tegm. [male], 3:3 millim. ; [female], 22 millim. Exp. tegm. [male] , 80 millim. ; [female] , 70 millim.